Why do different people sometimes get different articles about the same event, sometimes from the same news provider? What might that mean for democracy? 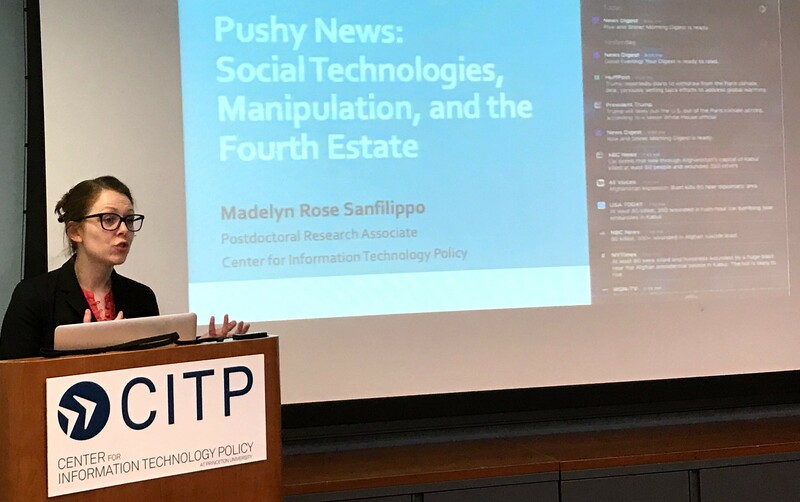 Speaking at CITP today is Dr. Madelyn Rose Sanfilippo, a postdoctoral research associate here at CITP. Madelyn empirically studies the governance of sociotechnical systems, as well as outcomes, inequality, and consequences within these systems–through mixed method research design. Today, Madelyn tells us about a large scale project with Yafit Lev-Aretz to examine how push notifications and personalized distribution and consumption of news might influence readers and democracy. The project is funded by the Tow Center for Digital Journalism at Columbia University and the Knight Foundation. Why Do Push Notification Matters for Democracy? Americans’ trust in media have been diverging in recent years, even as society worries about the risks to democracy from echo chambers. Madelyn also tells us about changes in how Americans get their news. Push notifications are one of those changes– news organizations that send alerts to people’s computers and to our mobile phones about news they think are important. And we get a lot of them. In 2017, Tow Center researcher Pete Brown found that people get almost one push notification per minute on their phones– interrupting us with news. In 2017, 85% of Americans were getting news via their mobile devices, and while it’s not clear how many of that came from push notifications, mobile phones tend to come with news apps that have push notifications enabled by default. 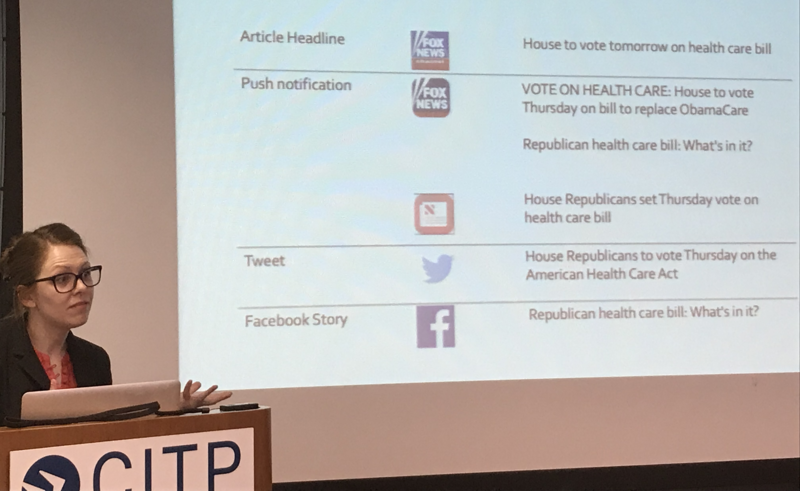 When Madelyn and Yafit started to analyze push notifications, they noticed something fascinating: the same publisher often pushes different headlines to different platforms. They also found that news publishers use language with less objectivity and more subjective, emotional content in those notifications. Madelyn and Yafit especially wanted to know if media outlets covered breaking news differently based on political affiliation of their readers. 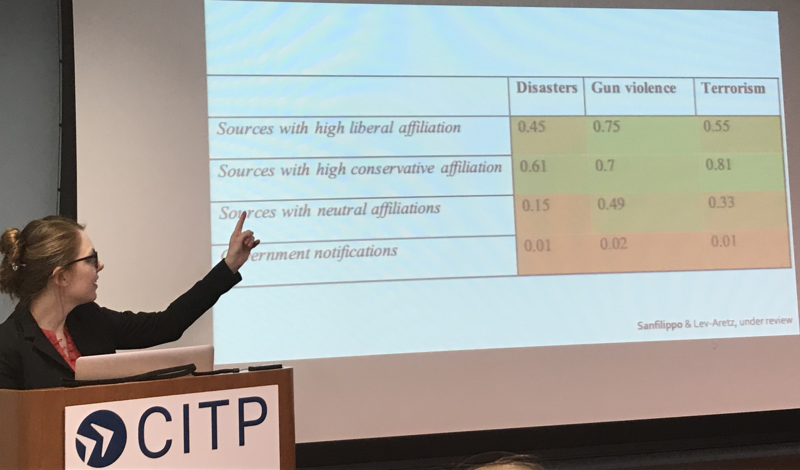 Comparing notifications of disasters, gun violence, and terrorism, they found differences in the number of push notifications published by publishers with higher and lower affiliation. They also found differences in the machine-coded subjectivity and objectivity of how these publishers covered those stories. Do Push Notifications Create Political Filter Bubbles? Together, they found that location based personalization is common. Madelyn tells us about three different notifications that NBC news sent to people the morning after the Democratic primary. 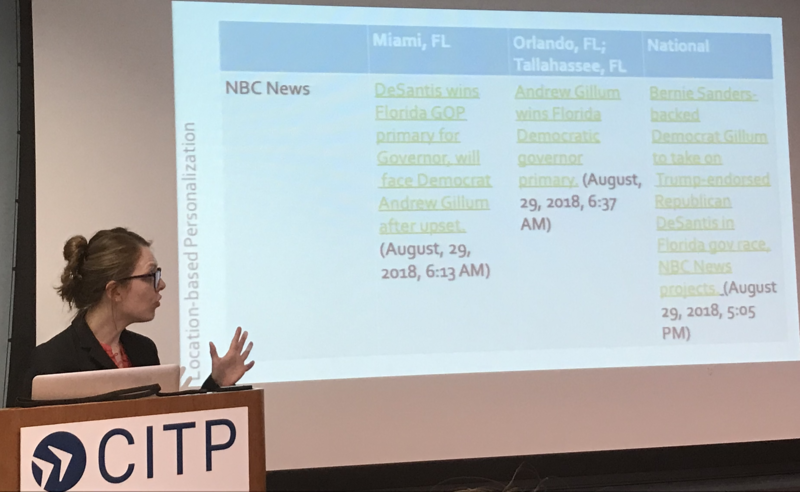 Not only did national audiences get different notifications, but different cities received notes that mentioned Democrat and Republican candidates differently. Aside from midterms, Madelyn and her colleagues found out that sports news is often location-personalized. Madelyn tells us that many news publishers also personalize news articles based on information about their readers, including their reading behavior and surveys. They found that some news publishers personalize messages based on what they consider to be a person’s reading level. They also found evidence that publishers tailor news based on personal information that they never provided to the publisher. How can we ensure that news publishers are serving democracy in the decisions that they make and the knowledge they contribute to society? In many publishers, decisions about the structure of news personalization are made by the business side of the organization. Madelyn tells us about future research she hopes to do. 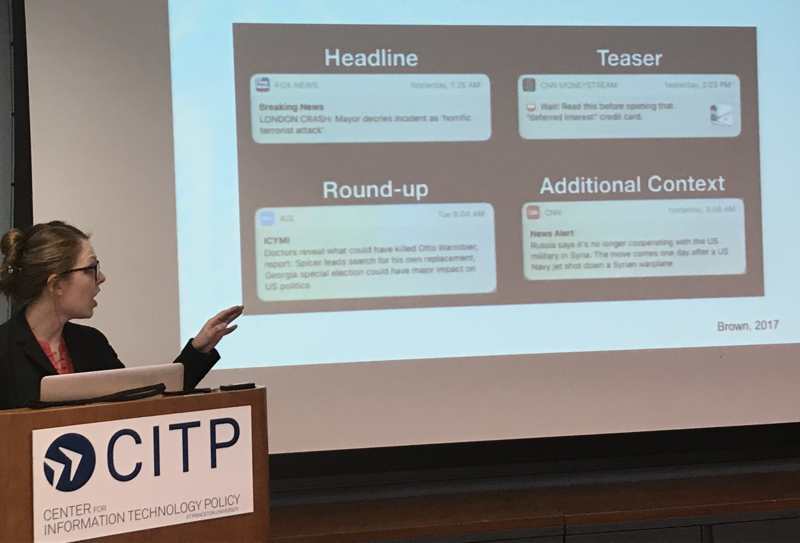 She’s looking at the means available to news readers to manage these notifications as well as policy avenues for governing news personalization. Madelyn also thanks her funders for supporting this collaboration with Yafit Lev-Aretz: the Knight Foundation and the Tow Center for Digital Journalism.